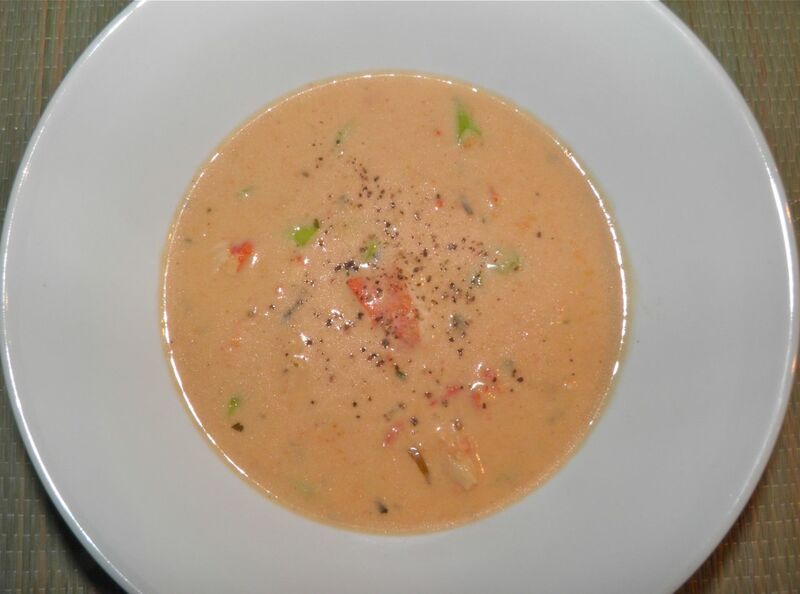 Part of the colour in lobster bisque comes from the lobster meat itself. I was stuck with a problem recently, one that many of you wouldn’t mind having I’m sure. We had been visiting my mother and, as I quite often do, I purchased ingredients and prepared dinner for her. In the meantime, unaware, she had thawed out a can (12 oz/340 g) of lobster claws, knuckles and legs. She sometimes buys it for a special treat for us (and her) when it is on sale. It's with the very best of intentions to make us happy. But if you have something special about every four weeks it soon looses it’s “specialness.” I was glad I bought groceries to cook something different for her but I was still stuck with a thawed can of lobster. 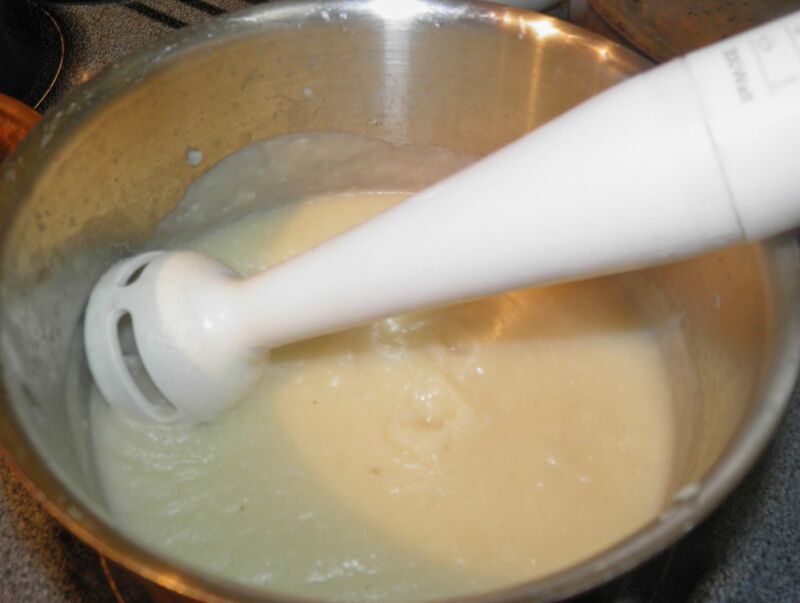 A purée of potatoes and onion serve as the base thickener. What to do, what to do… Lobster, if not freshly boiled, is delicious in homemade ravioli, or combined with ricotta and herbs for a cannelloni filling. But both of them are a fair pile of work. We had a busy weekend so I opted for something on the simple side. Lobster bisque fit the bill nicely. It’s capable of being on the table in about 1/2 hour and with the addition of potatoes is “hearty” enough for an entree as opposed to appetizer. 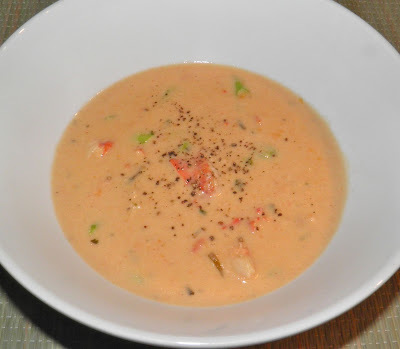 Bisque is a French highly seasoned creamy soup, usually made with crustacean stock, and often has puréed vegetables. It is believed that the name comes from the Bay of Biscay between France and Spain, but the seafood is bis cuites (cooked twice: the shells for the stock and the meat itself in the soup) so who really knows. My recipe below has complex flavours that blend very nicely, and good body. It’s neither too thick or too thin. It’s not too tomatoey or not, and the herbs and spices are in great balance. It’s just right. Even Goldilocks would approve I assume. I hope you approve too. 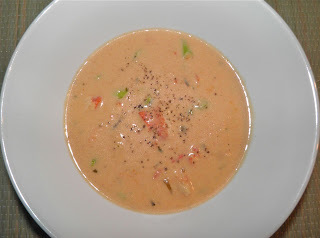 This is wonderful way to serve a “lobster chowder” that’s far more than boiling some potatoes and throwing in some meat. You should really try it. I’m suggesting that you serve it with olive oil fried bread. If you’ve never had fried bread you’re in for a real treat. It is usually made from day old Italian bread. Just brush it with olive oil and brown it in a frying pan. A little sprinkle of salt brings out the olive oil flavour. This is everything except for the lobster and final butter. What can I say. You eat first with your eyes. Heat 2 tbsp of butter in a large stock pot. Add the onion and garlic a sauté on medium low until the onions are translucent, about 5 minutes. Do not brown. Add the potatoes and sauté for 2 more minutes. Then pour in the stock, add a little salt and the bay leaves. Bring to a boil, reduce heat to medium and let simmer, covered, for 10 minutes until the potatoes are tender. Remove the bay leaves and purée the potato mixture with an immersion blender until smooth. Stir in the Worcestershire, hot pepper sauce, tarragon, paprika, tomato paste and sherry. Mix well to combine. 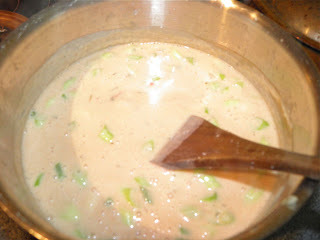 Then stir in the cream and green onions. Let the cream come nearly to a boil, reduce heat, and then add the lobster and let heat through, about 3 minutes. Check the seasonings and add salt and pepper to taste. Stir in the remaining butter and serve. Serve with slices of Italian or French bread that have been brushed with olive oil, browned in a frying pan and lightly sprinkled with salt. Update 2: World, Welcome Baklava Liqueur! Gardening Guide: What’s Blooming Now?